Check out the BlackBerry Storm at the Developer Conference | BlackBerry Blast! If you can't wait to get your hands on the BlackBerry Storm head on over to the BlackBerry Developer Conference in Santa Clara. 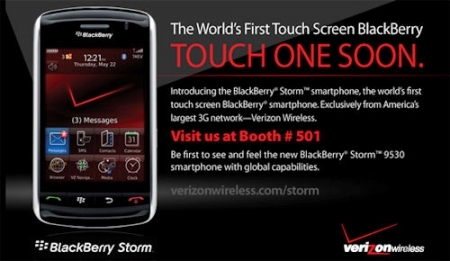 Verizon will make the BlackBerry Storm available at their booth for you to play with. The BlackBerry Developer Conference is in Santa Clara, CA on October 20-22, 2008. Verizon's booth is #501.